What does a beautiful and famous fashion blogger, a nationally renowned women’s fashion brand and me have in common? A blog post (ha!) and myself in front of the camera for the first time. I’m going behind the scenes (like waaaay behind the scenes) of the awkwardness, the fears and a few life lessons in what I learned from my first ever fashion photo shoot. Come see what made this moment a turning point in my career. It was a fabulous idea. 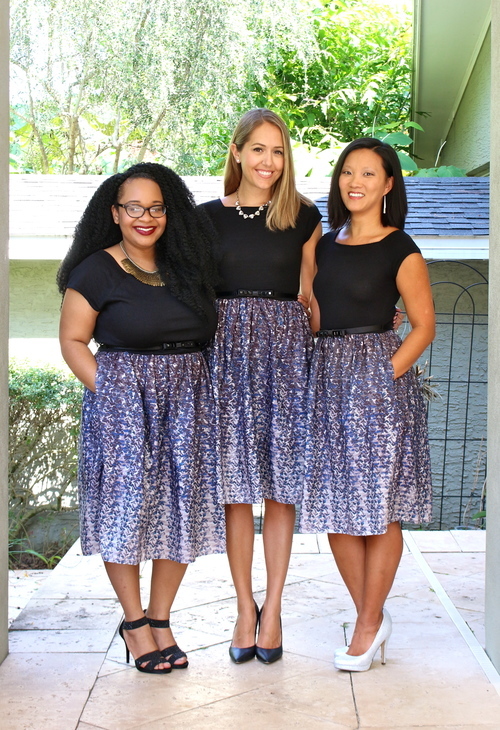 Jeanette Johnson, a beautiful, inspiring and famous fashion blogger (aka J of J’s Everyday Fashion) had a brilliant idea to go along with her latest fashion campaign, dressbarn’s rebrand as Dressbar. 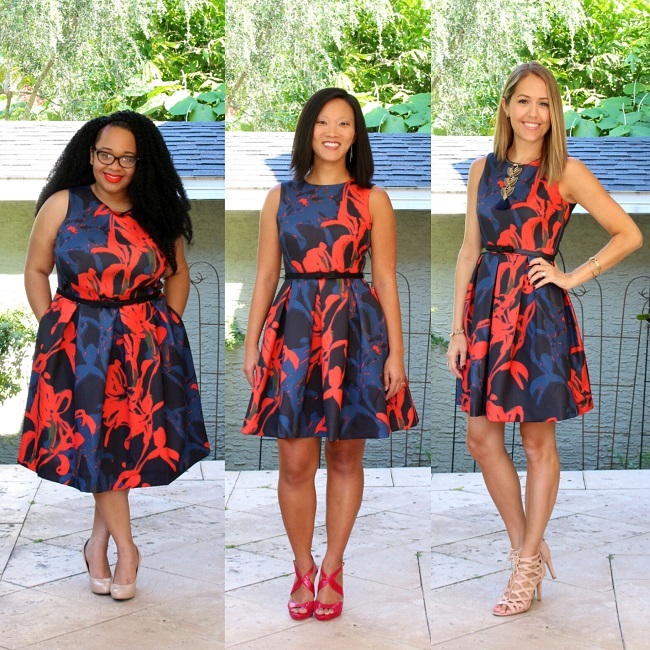 She would showcase how the new dress designs fit on petite, misses and plus sized women…all at the same time. Taking care of the misses modeling for herself, she just needed a petite fashion blogger and a plus sized fashion blogger to join her. Sounds like a perfect story for a someone that was NOT me. But thus begins my fashion photo shoot journey and your reading pleasure. What did I learn? A whole lot more than I expected. When J originally pitched to work with petite fashion bloggers for this campaign, I immediately thought “Absolutely NOT me.” I had no fashion experience. I was sitting at home in my yoga pants and messy hair bun, having just changed another poop diaper from my stubborn non-potty training daughter. Oh and I just had a new red zit pop up on my chin. Not my day to feel beautiful, fashionable or confident. Shaking my head, I threw my name into the group anyway. But I did it. I made a move totally outside of my comfort zone and felt that small glimmer of satisfaction. I did something completely outside of my norm and comfort level. Playing with Pumpkin Play Dough, creating a Baymax lunchbox, even showing off fashion on my 2 beautiful kids is completely within my work zone. But standing in front of a camera instead of behind it is a completely different story. I had no clue what I was doing, and it showed. While J breezed through about 20 poses in about 10 seconds (no, seriously!) I stood there like a sloth with narcolepsy. Where do I place my hands? Tilt my head how? I wasn’t used to having any sort of spotlight on me and my nervous laugh was echoing through the shoot. I was awkward, but as uncomfortable as I felt it was exhilarating to dip my toes into something new, unknown and out of left field. Did I become a superstar fashion model overnight? Absolutely not. I was weird, awkward and needed a few extra frames (like 50 or so) to make up for my lack of modeling experience. But I learned so much. From how to stand to getting out of my self-doubt frame of mind to a few fashion blogger tricks and tips, it was an eye opening experience. And I’m so glad that I did it. While I certainly will NOT ever be labeling myself a fashion blogger, I grew as a blogger in one afternoon, just by experiencing something outside of my genre. I am so blessed with my line or work. Literally every new day, every new conversation can spark a new opportunity for my blog. If you had told me that speaking at FLBlogCon would lead to a fashion photo shoot, I probably would have asked if you were intoxicated. It sounds insane. But there I was at the FLBlogCon afterparty, talking to THE Jeanette Johnson, aka J of J’s Everyday Fashion…and I was in shock that she knew my name. A 5 minute conversation later, I was standing with J for her blog. Ah-mazing. You never know where blogging may take you. And if I learned anything from this experience, it’s always to look at a situation as an opportunity. As a person with continuously low self-esteem, it’s so hard to say the 3 words “I am beautiful.” In fact, I can only count a handful of times when I felt really, really beautiful. My wedding day. When I was pregnant. The Cinderella Red Carpet Event. And now I can add that time I stood next to a nationally famous fashion blogger. My first ever fashion photo shoot is in the books. And even through the awkwardness, the fears and all, I look at these photos with pride. I look kinda-sorta-in-a-way amazing. And it’s a great memory to take with me as I plug along life. I. Am. Beautiful. If you happen to be in the Orlando area on Thursday October 22, 2015 from 6-8 pm, come join me at the Dressbar event at the Orlando Premium Outlets. 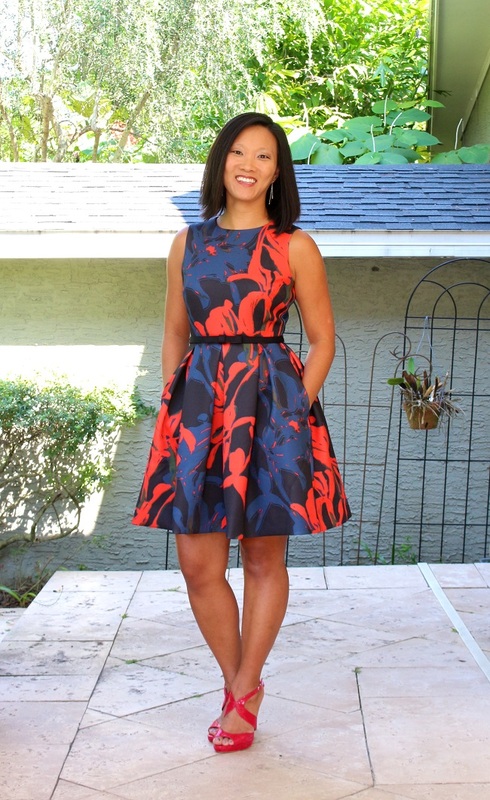 I’ll be sporting my new dressbarn dress and would love the opportunity to chat with you! 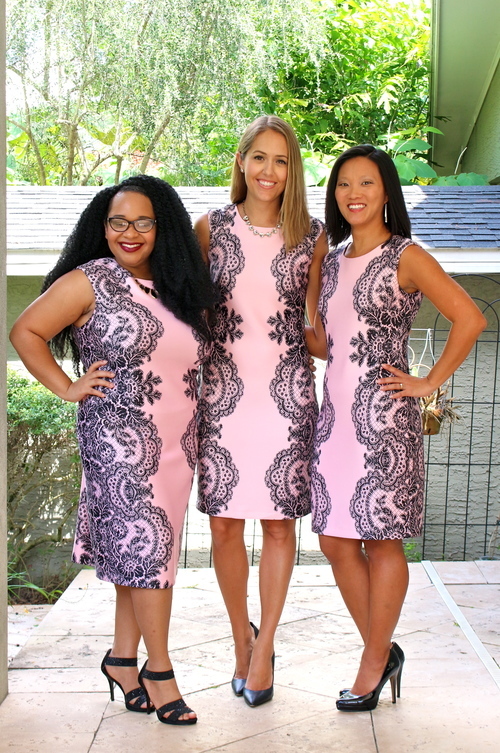 And if you want to check out the post results, head over and see dressbarn in three sizes over at J’s Everyday Fashion! So honored to stand next to 2 amazing fashion bloggers. Be sure to follow Raising Whasians via Facebook, Twitter, Google, Instagram, Pinterest and YouTube for more of my personal life moments, fashion experiences (ha! ), recipes, crafts, travel and more. Firstly, I had such a fun day hanging with you two ladies for the day. Also, I think you may have inspired by next blog post with this. You looked absolutely beautiful and yay for doing things outside of your comfort zone. Christie, you ARE beautiful! Loved this post and the amazing blogger collab. Gives me all the feels <3. See you Thursday! Thanks, Whitney! Looking forward to seeing everyone on Thursday! Christie, you crack me up!!! You were fabulous and you definitely didn’t need 50 extra frames! I’ve never felt totally comfortable in front of the camera myself though so I can totally relate. Thank you for going out of your comfort zone for this shoot, it was great to have you!! I think you look AMAZING (with no adjectives) Which dress did you like best. I think you rock the red one and the one with the black top looks good too. The red was definitely my fave! Thanks for the compliment, Sarah! I think you look wonderful in the photos. As you said, it’s all about stepping out of your comfort zone. I love that pink and black dress. All three of you look stunning in it. Thanks so much, Terra! Hoping to do more stepping out of the comfort zone in the future! As I get older, I’m trying to do as many things as I can outside my lines of comfort. I hate having my picture taken and think this would have been a new, fun thing to do! Good for you. Good for you for moving out of your comfort zone! I struggle with that myself. You look great! And wow, those dresses really do look great on everyone.